Our staff is a progressive group of knowledgeable horse lovers ranging from competitive equestrians to trail and pleasure horse riders. They are dedicated to the compassionate care of our client’s horses and visiting horses. All of our team members come with years of horse experience. 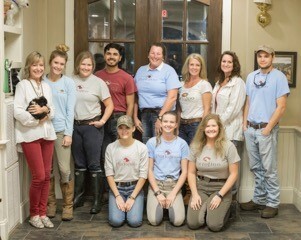 The team comes with training ranging from daily operations and procedures to equine safety and wellness education so that they are ready and prepared to rise up to any challenge that may present itself. Not much out of the ordinary ails our horses at Portofino but when it does the team is ready to respond! VERNE BATCHELDER clinics once per month.